You already made a blinking LED and controlled it in the interactive session. But you have only feed it with the values of true and false. The false value auto-converts to 0 and represents no glow at all, whereas the true value converts to 1 and denotes the full brightness. You can also set an intermediate brightness level by setting values between 0 and 1. Assemble a circuit according to the scheme, and connect the board to your computer. Set the value of the PORT pin to D11. Leading “D” means that it’s a digital port. Replace the tweak-boolean node with tweak-number. Upload the program with the interactive session enabled. Change the value of tweak-number in the range from 0 to 1 and see how the brightness of the LED changes. An LED can change the brightness only if connected to a board pin which supports PWM. 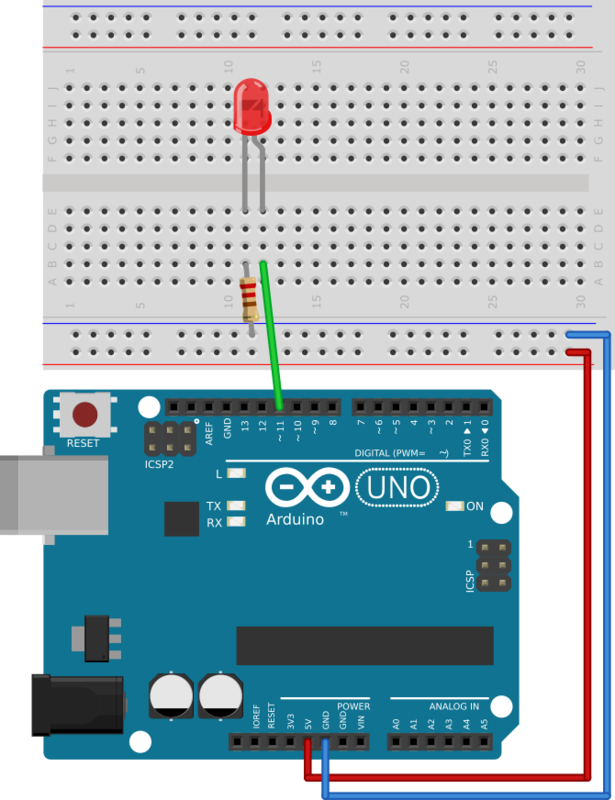 If you have an Arduino board, find out the port number with the leading “~” symbol. Many board models have no PWM on D13, so we wire the LED to another pin.